Nearly 3.4 million young people in the UK live with or care for a parent with a mental illness. The issue of mental health and young people has become a widely discussed topic in recent years. Mental health charities now work harder than ever whilst NHS budgets reduce. It's a difficult landscape, yet mental health is no longer such a taboo topic. It's finally being openly discussed, which is long overdue. One area of mental health that is often overlooked is parental mental illness. When we hear those words, most of us think that we understand what it means, but the reality is that we don't. It's a complex issue - and one that's difficult to convey. This is where the charity Our Time fits in. They create safe and supportive environments for young people dealing with parental mental illness. They campaign for greater recognition and understanding of the issues these young people face. 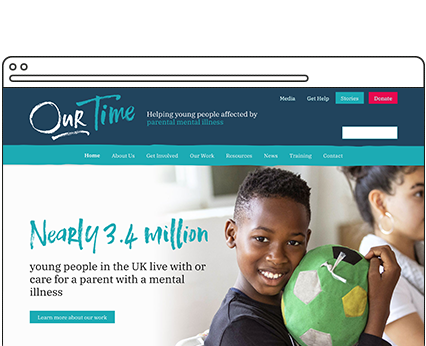 Our Time asked us to help develop their new identity and website. We were thrilled to work with such an important charity at a crucial crossroads in their history. Previously known as the Kidstime Foundation, the charity was in the midst of renaming their organisation when they approached us. Nationally recognised, their workshops are highly regarded by mental health professionals. Having chosen their new name, Our Time, they required an identity that reflected the wider work that they do, and moved closer to the young people they work with. Their brand needed to stand alongside, yet differentiate, from other mental health charities, whilst reflecting the quality of their work, as well as their direct and proactive approach to tackling the issue. Of course, these challenges are never straightforward. Our Time work with young people of all ages as well as professionals, teachers and parents. So their brand also needed to be flexible and engaging for a wide variety of audiences, and work across their huge variety of applications. Armed with a more relevant an inspiring name, we helped them develop a more relevant brand and professional website. We started with a detailed discovery and strategy phase to help clarify their message and positioning. Getting to grips with the depth of this complex issue meant that Our Time's guidance and expert knowledge of the subject was invaluable. In order to share knowledge from both sides, we ran a workshop with the team. This collaborative approach meant we had a good foundation to continually bounce ideas back and forth, allowing us to quickly design effective solutions. We worked through a series of design routes, developing them into a brand style that felt organic, friendly and people-focussed. We developed hand brush-stroked typography which contrasts boldly with a serif style. This featured lots of big images of young people and an upbeat, loose style. We particularly explored the idea of flipping the brand on its head through contrasting and sometimes contradictory elements. The issue of parental mental illness is something that people think they understand, but in reality it is something quite different. The brush strokes and hand-drawn elements are as unique as the individuals that Our Time work with. Because workshops are run externally, it was vital that the brand was easy to apply consistently. Therefore we developed clear easy to follow brand guidelines and flexible templates. Our Time were not simply replacing an existing site, but completely repositioning their message and content at the same time. Due to the large amount of content, we worked through an in depth site-mapping and wireframe process - and helped them with a content plan. The Resources section in particular had a lot of complex functionality required, delivering a huge variety of content and media types. We built a highly flexible system that is 100% designed to Our Time’s exact needs. Due to their varied audience, making the content relevant was absolutely paramount. The messaging and flow of the pages needed to be very different for a page aimed at young people versus a page aimed at professionals, for example. Therefore we developed a system that allows Our Time to build their pages using a modular system, crafting engaging pages to each audience. A custom sign-posting feature allowed users to quickly identify and view content specific to their requirements.